Retail sales declined 0.1% to $50.8 billion in August, following a 0.2% increase in July. Sales were down in 7 of 11 subsectors in August, representing 52% of retail trade. Lower sales at gasoline stations (-2.0%) more than offset gains at motor vehicle and parts dealers (+0.8%). Excluding motor vehicle and parts dealers, retail sales declined 0.4%. In volume terms, retail sales decreased 0.3%. Receipts at gasoline stations were down 2.0%, largely reflecting lower volumes in August. After removing the effects of price changes, gasoline sales decreased 1.9%. Lower sales at clothing and clothing accessories stores (-1.2%) stemmed primarily from clothing stores (-1.1%), which saw sales decline for the first time in six months. Sales at building material and garden equipment and supplies dealers (-1.1%) declined for the second consecutive month. Gains were reported at motor vehicle and parts dealers (+0.8%) for the first time in three months. The increase was largely attributable to higher sales at new car dealers (+1.3%) and, to a lesser extent, automotive parts, accessories and tire stores (+1.5%). Sales at health and personal care stores (+1.6%) increased for the third time in four months. Retail sales were down in four provinces in August. Quebec posted the largest decrease in dollar terms, followed by Saskatchewan. Sales in Quebec declined 0.7%, in large part due to lower sales at motor vehicle and parts dealers and gasoline stations. Sales in the census metropolitan area (CMA) of Montréal were relatively unchanged. In Saskatchewan (-2.7%), lower sales at motor vehicle and parts dealers were the primary contributor to the decline. Sales in British Columbia edged down 0.1%, while the CMA of Vancouver (+0.9%) recorded a gain. Retail sales continued their upward trend in Ontario (+0.3%), rising for the fourth consecutive month. Higher sales at motor vehicle and parts dealers led the increase in August. Retail sales in the Toronto CMA were up 0.3%. Increases were reported in every Atlantic province in August. Nova Scotia (+0.5%), Newfoundland and Labrador (+0.4%) and Prince Edward Island (+1.1%) each reported a second consecutive increase, while retail sales in New Brunswick (+0.6%) grew for the fourth month in a row. The figures in this section are based on unadjusted estimates (not seasonally adjusted). On an unadjusted basis, retail e-commerce sales totalled $1.4 billion, representing 2.6% of total retail trade. On a year-over-year basis, retail e-commerce rose 13.9%, while total unadjusted retail sales increased 3.7%. Summary tables of unadjusted data by industry and by province and territory are now available. For information on related indicators, refer to Latest statistics. All data in this release are seasonally adjusted and expressed in current dollars, unless otherwise noted. For information on seasonal adjustment, see Seasonally adjusted data – Frequently asked questions. Statistics Canada's retail e-commerce figures include the electronic sales of two distinct types of retailers. The first type do not have a storefront. These businesses are commonly referred to as 'pure-play' Internet retailers and are classified to North American Industry Classification System (NAICS) 45411—Electronic Shopping and Mail Order Houses. The second type have a storefront and are commonly referred to as 'brick and mortar' retailers. If the online operations of a brick and mortar retailer are separately managed, they too are classified to NAICS 45411. Common electronic commerce transactions, such as travel and accommodation bookings, ticket purchases and financial transactions are not included in Canadian retail sales figures. For more information on individual Internet use and e-commerce, consult the most recent release of the Canadian Internet Use Survey and/or the Survey of Digital Technology and Internet Use. For more information on retail e-commerce in Canada, see Retail E-Commerce in Canada. Total retail sales expressed in volume terms are calculated by deflating current dollar values using consumer price indexes. The retail sales series in chained (2012) dollars is a chained Fisher volume index with 2012 as the reference year. For more information, see Calculation of Volume of Retail Trade Sales. 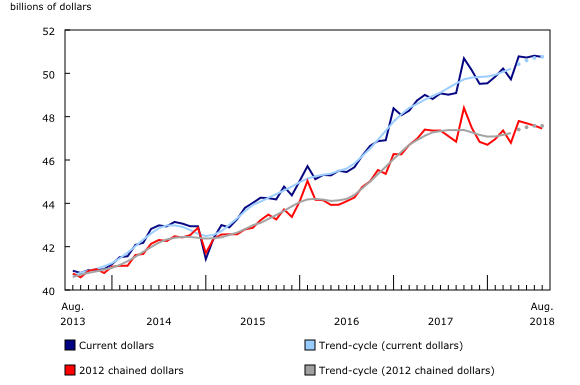 For information on trend-cycle data, see the StatCan Blog and Trend-cycle estimates – Frequently asked questions. Real-time tables 20-10-0054-01 and 20-10-0079-01 will be updated on October 29. Data on retail trade for September will be released on November 23. For more information, contact us (toll-free 1-800-263-1136; 514-283-8300; STATCAN.infostats-infostats.STATCAN@canada.ca). For analytical information, or to enquire about the concepts, methods or data quality of this release, contact Sandra Andric (613-951-0027; sandra.andric@canada.ca), Retail and Service Industries Division.